We designed our Hydration carrier to connect to our padded harness and chest rigs. 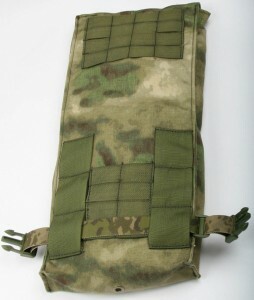 The hydration carrier can be attached to any molle plateform as well. 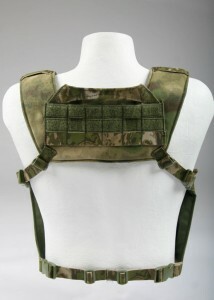 2- Minimize the molle on the back (most do not attach anything on the back of the carrier, save weight). 3- Support 2L and up to 3L bladders. 4- Size dimensions 18” long x 9” wide x 2.5” deep – handle most large bladders on the market. 5-Internal attachment points for different bladders. 6- Easy removal of the bladder to fill and clean. 7- Hydration Hose left or right side routing. 8- Velcro for ID, patches , blood type. 10- Routing webbing for chest rig waist straps. 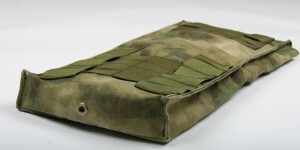 We wanted to reduce the weight of the hydration carrier by only adding a minimal amount of molle webbing on the outside. 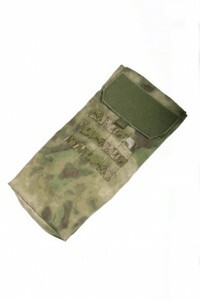 There are three rows by four columns center if an additional molle pouch is needed. There is also plenty of loop velcro realestate for those ID patches, morale and blood type patches. 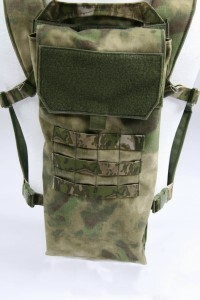 The unique feature of the hydration carrier is the 2” routing webbing that runs vertical on the back of the carrier designed for chest rig waist straps. 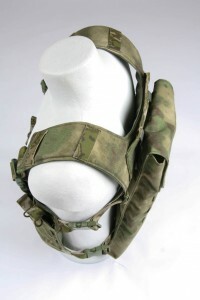 Between the waist straps there are four webbing rows by two columns for molle attachment or an additional means to secure a chest rig waist strap. The back top is covered with four rows of webbing by four columns for attachment to our padded harness. There is plenty of vertical adjustment. A single grommet centered in the bottom of the hydration carrier will allow for drainage. 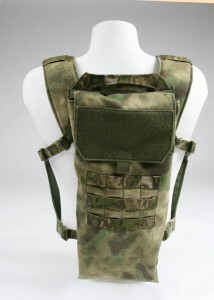 The padded harness and hydration carrier are great additions to improve the BCS chest rig. They both add comfort, function,stability and enhance performance.